I’m the nurse at the bedside. You might see me as an underachiever, someone who didn’t have what it takes. . . For those who assume I stopped and stagnated here, settling for “something less,” because I wasn’t capable or motivated to advance my career, let me tell you how I got here and why I stay. Let me introduce myself. I'm the nurse, the one at the bedside. It's a place I've occupied for twenty-four years. There are millions like me. You might see me as an underachiever, someone who didn't have what it takes to get into med school to become a doctor. Or you may think I'm stuck here because I'm not motivated enough to become a charge nurse, a department manager, or a director of nursing. It's true that quite a few RNs who used to work here beside me have moved on to management positions or other areas of advanced practice, becoming nurse practitioners or nurse anesthetists. Some got masters or doctorate degrees and went into teaching or research. Their successes in their chosen areas are admirable. We need good people in specialties, management, and education. It's also true that some friends and former coworkers left nursing altogether, choosing paths that placed them in areas commonly believed to be superior to what I do. One friend started a medical equipment company that eventually went public, making him a multi-millionaire in a matter of hours when the stock tripled during the IPO. One left nursing to become a lawyer, successful enough to run public adds promising big winnings for car crash injuries or slip and falls. One went to work as a financial consultant for a major Wall Street firm which manages 401Ks for hospitals. He laughs when he says, "Hey, we're paid to have an opinion. We're not paid to be right." He makes eight times as much as I do. Some left to be representatives for pharmaceutical companies or equipment suppliers. One RN cut back her hours to moonlight as an expert witness. She gets paid well to pick apart the scant written record which barely hits the essential highlights of everything the nurse at the bedside does to care for the patient. She says, "I sometimes feel a little guilty testifying against nurses because I know how hard it is just to keep my head above water on busy days. There's no way we can chart everything we do. But this is how the game is played; I didn't make the rules." For those who chose to advance your careers by leaving the bedside for whatever reason, I can understand and appreciate your choice. But for those who assume I stopped and stagnated here, settling for "something less," because I wasn't capable or motivated to advance my career away from the bedside, please, let me tell you how I got here and why I stay. I had a four-year bachelor's degree. I sat on boards of directors responsible for multi-million dollar budgets before going back for my 5th and 6th years of college education to become a nurse. I maintain certifications in BLS, ACLS, PALS, and the NIH Stroke Scale which are mandatory to be a staff RN in the ER. Trauma Nurse Core Course is optional, but I took it anyway. Certified Emergency Nurse is also optional. After testing for the first two certification cycles, I've chosen the continuing education renewal option, completing 100 hours of classes in my clinical area to qualify for each of the next four certifications. My hospital has forty-six annual mandatory online training modules covering everything from fire safety to services animals. There are ongoing in-services and annual skills fairs covering the safe operation of the wide range of sophisticated equipment in our department. Not a day goes by that I don't pick up some new tip on technique from a coworker or piece of information in some obscure area that sharpens my skill and knowledge base. My intuitive ability to discover the real story behind the illness gets sharper every year. Could I leave the bedside for any of the options noted above? Sure. Absolutely. But I choose to be here because this is where most of the actual patient care happens. Twenty years ago, I was accepted into a NP program with financial backing form my employer, but I choose to pass on the opportunity. When I listed the advantages and disadvantages on paper, for me, in my situation, the only real advantage I could see was higher pay. I prefer more direct interaction and hands-on delivery, even if it means getting paid less. In the ER, I watch the doctors and PAs do their two-minute assessment then disappear while I take care of the patient for the next two hours. When everyone else does whatever it is that they do--administrate, manage, write polices, debate ethics, study productivity charts, evaluate patients and write orders--at the end of the day, the lives of the patients and the care that they receive are placed into the hands of the nurse, the one at the bedside. Can you top that level of responsibility and reward? Do you really want to label me a stagnant underachiever? There is a bit of poetic irony here. If you see the bedside as a lesser place in the grand universe of healthcare, remember that the odds are heavily stacked that someday you will be here. Everyone who's never been here before will end up here. Everyone who's left the bedside will be here again. Someday, either as the patient or the distraught family member looking over my shoulder, you'll be back. You'll feel helpless and vulnerable then, and rightfully so, because your accomplishments, your power, your expertise and your money won't matter. When that day comes, I'm all you've got. Even if your skill is still intact, you won't be on the clock. You will look on, hoping and praying that I get the IV started on your dehydrated four-month-old who's becoming lethargic or your eighteen-month-old who's actively seizing on arrival in the ER. You'll watch anxiously as I attempt to get a catheter past your husband's swollen prostate to relieve his painful urinary retention when two other staff members have tried and failed. You will quietly wring your hands, praying that I correctly manage multiple infusions to pull your mother back from septic shock. You'll watch helplessly as I insert a bite block, an Ewald tube, and perform a gastric lavage on your brother who overdosed. When that day comes, any hints of disdain or condescension will go out the window, when your life or life of someone you love is in my hands, the nurse at the bedside. The good news is that I will be here for you. The years of dedication, learning, honing my clinical skill, and "advancing my career" in the same place I've occupied for twenty-four years, will all be to your benefit. I will confidently take your life, the life of your infant, your child, your spouse, your uncle or your grandmother into my hands. And I won't let you down. It's what I signed up for; it's where I choose to be. It's who I am. The nurse at the bedside. As a nurse manager, I'll just say that I appreciate nurses like you! We need the nurses with years and years of experience who can grow our new nurses. My unit has 3-4 nurses who have been on this unit for 20+ years and I will seriously cry when they decide to retire. 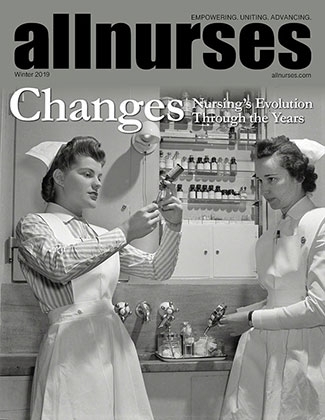 Thank-you for your article, I know it will encourage all "nurses at the bedside" . We are all stronger together and should all work together as such. Should I get sick I hope to find myself with a nurse like you!! I'd like to think that if you're happy in and love your work, you wouldn't need to justify your value, I guess that's in a perfect world. I love love love this. I'm a bedside nurse for life !!!! Always will be. Even though I now do CM, I'm always picking up PRN shifts in the floor. I can never give up patient care. In a perfect world, there would be no nurses, but here we are. Where I work, we have performance evaluations every 6 months, and salary increases are tied to the annual review. The new evaluation tool rolled out this year heavily favors management and bureaucratic activities over patient care in such a way that even poor managers will get an excellent score while excellent bedside nurses will come out as satisfactory. The inherent rewards of bedside nursing go beyond money, and most of us did not choose this profession to get rich. It isn't our nature to justify our value. But, if we fail to to do it, we will be exploited. Sometimes we need to gently push back against the growing illusion that career advancement means leaving the bedside. I pray that I find you in the ED/inpatient unit when I come in as a pt or family member. Too often the realization that the glue that holds pt care together is the bedside nurse comes only when you are in a critical situation. Thank you for all you do and for all these years of dedication. Love it! Especially the respect and esteem for your colleagues who have aspirations to be in management or advanced practice. I would've been utterly lost as a new nurse if there weren't experienced bedside nurses with their calm demeanor and their skill. HelloWish has 3 years experience as a ADN, BSN. I appreciate the seasoned nurses who chose to stay at the bedside! We need you! It wasn't my choice, but I have great respect for those who do stay and provide bedside patient care. I love bedside nursing (gyn/med/surg). It is the reason I went back to school to become a nurse (first degree is in Bioengineering). I have never turned down an opportunity to enlarge my skills, so I am also a competent psych nurse and postpartum nurse. I am a damn good bedside nurse but I am looking for a new job. I promised I would change roles if I ever was afraid that I might lose my heart for the patient. I am tired of having the hospital treating me like I am working a low skilled entry level form of nursing. I am tired of being accused of being lazy when we complain that staffing is becoming unsafe (all of us) and I don't have time to actually take care of the patients. I am tired of worrying that I might miss something important because I am in a different patient's room. I hate leaving charting undone and am getting frustrated that I always am signing out late and my q4 charting is often turning into q5-6 increments. I often don't get to eat. I almost never get a break. I have worked more shifts at critical staffing than not since the beginning of the year....and then our email is full of letters wondering why we are having so many falls on the unit recently. Dayshift is overstaffed and gets praise for their teamwork. Nightshift gets scolded for not restocking the cabinets, never mind that we are always short staffed and yet nobody is above just jumping in and assisting a co-worker in trouble. I am currently applying for every position that is NOT bedside nursing that I qualify for. I just can't do it anymore. I started both antidepressants and anti-anxiety meds to just deal with going to work. Another nurse who has been on our unit for over 12 years was just diagnosed with 30 ulcers. I am tired of coming in during my sleeping hours for "one more training" and have least 10 hours worth of mandatories that we have no down time to complete so I will do on my own time for free. Everyone says all the units are the same as ours so I am giving up on bedside nursing before I start to hate nursing all together. I will miss my patients though. Why are night shift bedside nurses the least valued nurses in the hospital? I am currently applying for every position that is NOT bedside nursing that I qualify for. I just can't do it anymore. Some people "advance" their careers away from the bedside for the same reason. It can be tough in the trenches. I've had some days when I've made a similar speech in a moment of discouragement following a really insane 12-14 hours of absolute chaos. I know there are days when I say, "if every day was like this, I couldn't keep doing this." But the rewarding experiences keep coming, our department managers try to solve problems, and, after some hours at the beach and a dance fitness class, I'm good for another round. Some things you can walk away from; some follow you wherever you go. I wish you peace and courage whichever path you choose.